This year, 2014, is half over. On the other hand, there are still 6 months remaining in this year. Do you find, like I do, that when looking back the days blur into chunks and only moments are retained in clear focus? I suppose my brain would explode if every moment of every day remained as sharp as the next. In June the irises and peonies came and went. We picked the first strawberries, the first radishes,and the first raspberries. Last night we picked over a quart of blueberries. In June we celebrated a birthday and honored fathers. Lavender and roses bloomed. There were cuddles and giggles with little ones. Other highlights: dinner on the patio, a visit to Butchart Gardens, tea and chocolate, the first popsicles, some rain and some tears, but mostly sunny skies and a light heart. For all these I am thankful. Joining Cheryl with Gathering the Moments. The perfect title for this post . . . moments gathered in one place, a gift to yourself, really, where you can come back to this spot and revel in the memories. Truly delightful! What a beautiful collage! Yes, you packed a lot of joy into the month. Blueberries...can't wait, but I am assuming that like everything this year, they'll be a little late. On to July! I can't believe June is about gone. It was a good month and July and August are going to be very busy for us. I like your collage of colour. Happy July to you. I don't like to think that the year is going by so fast. Soon our shops will be full of Christmas gifts. Not nice. Your collage is very lovely. Hadn't thought about the year being half over. Yikes, wasn't it just Christmas? It really is hard to believe how quickly time flies anymore. You have captured June in a most colorful and beautiful way. I hope your July is just as nice. June is zipping by in a flash. Somehow, several of the things that were going to be accomplished this month will be sliding into July. 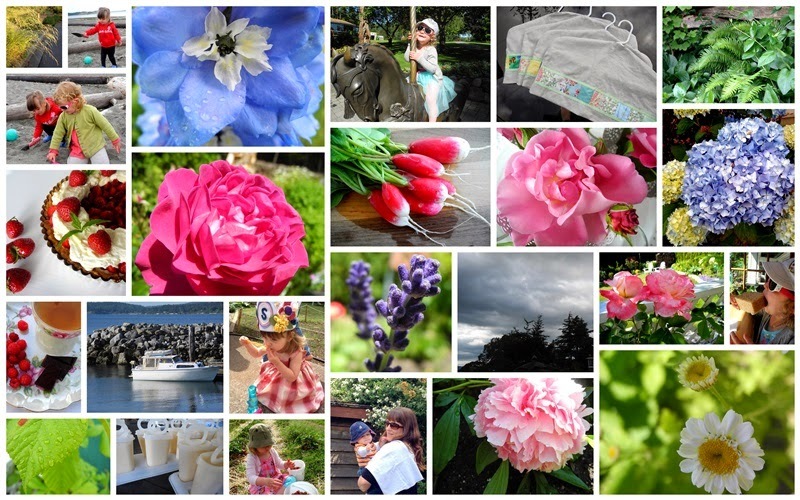 Your collage captures your month beautifully, Lorrie. What a beautiful collage...full of color and sweetness and blessing! I looked and looked at it, trying to take it all in. Sounds like a special June. Realizing the year is half over and I haven't even caught my breathe from the rush through the year, oh my! How can I breath when so much time moves oh so quickly and I want to cram more into my days. Thank you for sharing it with us. i am amazed too, that the year is half over and yet I look forward to the rest of the year! You gathered many special moments in June! Happy Canada Day to you and yours. LOVE this post!!! And yes, I do have trouble hanging on to all the moments. This is such a lovely way to save & share yours, Lorrie! June did rush by, and you do well to remember it. I spent the month preparing for a family reunion. July will be quiet by comparison. I loved your collage, love collecting the moments and reflecting don't you?